Algae are of significant environmental and commercial importance. The environmental impact of algal blooms can have significant negative economic consequences, however these are outweighed by the positive roles of algae. Algae are not only sources of food for humans and animals, but are also the sources of a wide range of chemical compounds such as the phycocolloids used in industry, food technology and as pharmaceuticals. In the last few decades the emphasis has moved from wild' harvests to the farming and controlled cultivation and to the production of valuable new products. Continued technical innovation and market demand will result in further major advances and an expansion of the commercially available species and products. Genetic engineering methods are also beginning to be used for strain improvement, and algal genes are being used for the improvement of other plants such as crop plants. Australia has a great algal diversity and this, combined with optimal conditions for commercial-scale algal production, provides great opportunities for new industries. Algae, especially toxic microalgae, are also having an increased impact on humans and this is leading to advances in the management of aquatic ecosystems to manage and control algal blooms. Microalgae culture is one of the modern biotechnologies. The first unialgal cultures were achieved by Beijerinck in 1890 with Chlorella vulgaris, and the use of such cultures for studying plant physiology was developed by Warburg in the early 1900's. Mass culture of microalgae really began to be a focus of research after 1948 at Stanford (USA), Essen (Germany) and Tokyo and the classic book edited by Burlew (1953) summarises many of these early studies. Interest in applied algal culture continued, especially with studies on the use of algae as photosynthetic gas exchangers for space travel and as microbial protein sources. Commercial large-scale culture of microalgae commenced in the early 1960's in Japan with the culture of Chlorella followed in the early 1970's with the establishment of a Spirulina harvesting and culturing facility in Lake Texcoco, Mexico by Sosa Texcoco S.A. In 1977 Dai Nippon Ink and Chemicals Inc. established a commercial Spirulina plant in Thailand, and by 1980 there were 46 large-scale factories in Asia producing more than 1000 kg of microalgae (mainly Chlorella) per month (Kawaguchi, 1980) and in 1996 about 2000t of Chlorella were traded in Japan alone. Other Spirulina plants were eastablished in the USA (eg. Microbio in California and Cyanotech in Hawaii). Commercial production of Dunaliella salina, as a source of ß-carotene, became the third major microalgae industry when production facilities were established by Western Biotechnology Ltd and Betatene Ltd (now Cognis Nutrition & Health) in Australia in 1986. These were soon followed by other commercial plants in Israel and the USA. As well as these algae, the large-scale production of cyanobacteria (blue-green algae) commenced in India at about the same time. More recently several plants producing Haematococcus pluvialis as a source of astaxanthin have been established in the USA and India. Thus in a short period of about 30 years the industry of microalgal biotechnology has grown and diversified significantly. Several species of microalgae, especially green algae, accumulate high concentrations of carotenoids such as ß-carotene, astaxanthin and canthaxanthin. These carotenoids have wide application as natural colourants and antioxidants. The first of these carotenoids to be commercialised was ß-carotene from the green halophilic flagellate, Dunaliella salina and Australia is now the major producer of natural ß-carotene from Dunaliella. Research on Dunaliella production began in Australia in the mid 1970's at the Roche Research Institute of Marine Pharmacology and also at CSIRO and eventually resulted in the construction of two production plants in South Australia and Western Australia. Other Dunaliella plants are currently being developed at Dampier in Western Australia. The ability to grow at very high salt concentrations where few other organisms can survive, its high temperature tolerance (up to about 40oC), and the high cell content of ß-carotene (up to 14% of dry wt.) made this alga an attractive candidate for commercial production of this carotenoid. The extreme conditions under which this alga grows means that relatively simple cultivation systems can be used. 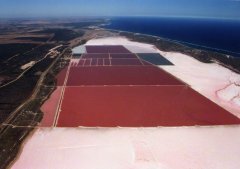 The two commercial production plants in Australia, at Hutt Lagoon in Western Australia and at Whyalla in South Australia use large shallow ponds of several hundred hectares in area to grow the alga. These ponds have a depth of between 30 and 60 cm and are only mixed by wind and thermal convection. The harvested biomass is extracted and pure ß-carotene or mixed carotenoids are sold as a nutritional supplement and natural food colouring. Dried Dunaliella powder is also sold as a feed additive for aquaculture to pigment crustaceans such as prawns. Another carotenoid of great interest is astaxanthin. Astaxanthin is used as a pigmenter for farmed salmonid fish as well as a dietary antioxidant. The production of algal astaxanthin from Haematococcus pluvialis is quite a different process from that used for ß-carotene production from D. salina. The chlorophyte, Haematococcus pluvialis is a freshwater alga which normally grown in temporary water bodies such as depressions in rock, puddles, flowerpots and birdbaths. The optimum temperature for growth is about 22-25oC. Furthermore, the astaxanthin is produced in a thick walled resting stage, the aplanospore, whereas maximum growth occurs in a green thin-walled flagellated stage. This necessitates a two-stage culture process, one optimised for biomass production and the other for astaxanthin production. Being a freshwater alga, open air culture as used for Dunaliella, Chlorella and Spirulina is not feasible, and Haematococcus must be grown in a closed photobioreactor to avoid contamination. The large-scale culture systems proposed for this alga involve a growth stage in a closed, temperature controlled photobioreactor to achieve maximum biomass, followed by a astaxanthin-accumulating stage under high light conditions, preferably in nutrient poor medium. Commercial production is under way in Hawaii and Israel, and other ventures have been proposed elsewhere. Research on algal production of other carotenoids such as lutein and canthaxanthin from other algae such as Chlorella spp. and Chlamydomonas spp. is under way. The phycobilin pigments produced by cyanobacteria, rhodophytes and cryptophytes (i.e. phycocyanin and phycoerythrin) have applications as food colourings, in cosmetics and as fluorescent dyes for flow cytometry and in immunological assays and their use in the latter applications is wide spread . The main commercial sources are the cyanobacterium, Spirulina and the red unicells Porphyridium and Rhodella.